Could you switch from a caravan to a motorhome? Having recently spent three days testing the new Bailey Motorhome Liz King ponders over a potential switch from caravanning to motorhoming. There are pros and cons for caravans and motorhomes. 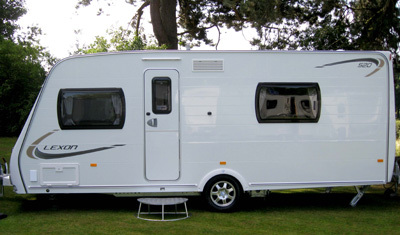 One of the major differences is the way you use a caravan or motorhome; with a caravan you arrive on site, unhitch, level it, wind down the corner steadies, put on your security system (check the wording of your insurance policy carefully to ensure that you meet the requirements of the policy) connect to mains electric (please attach the cable to your unit before you connect to the mains bollard) fill the water containers, etc and then there’s the interior to sort out. With a motorhome we arrived on the pitch, levelled up and connected to mains electric. We had a full 100L on-board water tank, and an empty 100L grey water tank, so no need for several minutes work outside. I particularly liked swivelling my cab seat around and I was in the habitation area without going outside! So a definite plus point for the motorhome. Conversely, with a caravan you can display your knickknacks on shelves when you arrive on your pitch and go off in your tow vehicle; with a motorhome, unless you tow a small car or have bikes, then every time you move it, you have to make everything safe and just as importantly, quiet for travel. In a caravan, you’ve no idea what noise is created during towing, no matter how you pack for travel. Plus point for caravans then. 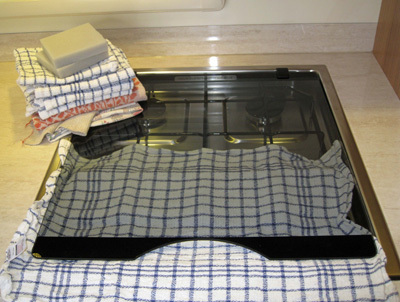 In the motorhome we lined the shelves and cupboards with non-slip mats, and used tea towels and bubble wrap. We put wrapped crockery and glasses into lidded plastic boxes; cutlery was wrapped in tea towels and packed tightly into the cutlery rack. We used pan protectors bought from Lakeland inside our stacking saucepans and put non slip in the kitchen sink to stop the bowl sliding around. Lockers were so tightly packed you couldn’t get a fag paper in. Everything that we needed was taken out of its store as needed and put away afterwards. 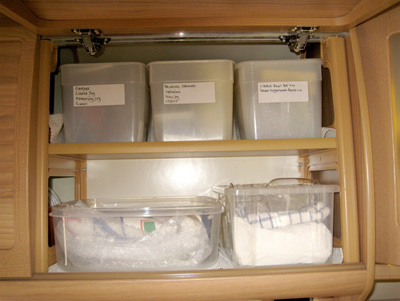 Toiletries were kept in our wash bags; in the caravan we keep them in plastic baskets in the drawer under the basin. We’ve experienced noisy motorhome journeys in the past and believe me, they are very wearing, tiring and distracting for the driver. It’s not a good idea to wander round the habitation area for any reason whilst the vehicle is moving. Of course there are other considerations to motorhome ownership that need to be compared to caravan ownership. If you bought a small motorhome could you get rid of your towcar and use your holiday home on wheels as your main mode of transport? 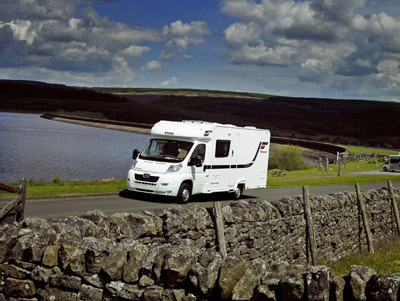 You would also need to weigh up cost of motorhome insurance and costs of running the motorhome. And if you’re looking at an extra large motorhome you would need to check your driving licence to ensure you can legally drive it – check the DVLA website for more details (http://www.direct.gov.uk/en/Motoring/DriverLicensing/WhatCanYouDriveAndYourObligations/DG_10037875 ). So the choice is a caravan or motorhome, it’s swings and roundabouts; we wouldn’t rule out motorhome ownership, but wouldn’t rule it in either; perhaps the answer is to own both! There will be plenty of both to see, and new models galore from many manufacturers, at the Motorhome and Caravan Show at NEC Birmingham from October 11th to 16 so take your notebooks and camera and create your own list of pros and cons! If you’re thinking of making the change from caravan to motorhome, let us know your reasons below. Security is something to keep in mind. We have had both over a period of some 40 years, going from one to another as the mood took us. However just recently our VW campervan was broken into in Spain and they cleaned us out. The point here being that with a motorhome you have everything with you, and if you are touring on an extended trip, that can be quite a lot of expensive gear! With a caravan you can leave stuff on a (relatively) secure campsite, and go off in your car without all your possessions with you. However the thieves, know what to expect in a motorhome with foreign plates, parked near a beach! You can’t take everything with you when you go on the beach, or to a market or even out for a meal! You pays yer money and takes yer choice!! Thanks for sharing your story Peter and very sorry to hear of the theft you experienced. I’ve had both, currently own a small newish caravan. However a plus for the motorhomers not mentioned yet is that of late departures. Some sites let you leave late for a small fee, but on the last two occasions we wanted to do this required relocating our pitch as ours had been booked. Easy for a motor home, hassle for the caravan. I believe that the motorhome versus caravan argument is pointless. There needs to be an acceptance that the two serve very different functions. Essentially, if you are touring from place to place, the motorhome will probably serve you best as the journey is basically linear. 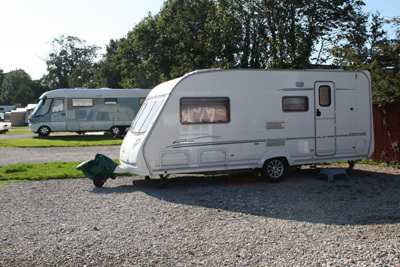 However, choosing a convenient spot from which to visit many places might allow you to think of your caravan as the hub of a wheel with spokes radiating outwards to different locations using your tow vehicle. So, cut according to your cloth and try not to let envy to lead you into wanting something that may be inappropriate to your needs. We are loving our Paradise Motorhome and travelling Australia. Finding conversations whilst driving are rather difficult due more to engine noise than “rattles and shakes” in cupboards. Thinking of finding headphones to use so we can have conversations with out constantly repeating ourselves. I guess if this is our only problem in our motor homing lives we should not complain. We are about to change from caravan to our first motorhome, we want to use this to tour France, Spain etc and enjoy our retirement, we did notice in southern Spain last year, there were motorhomes to be seen in a lot of beach areas, but hardly any caravans on the roads. We have just changed our Freedom caravan for a Peugeot Boxer Avantgarde motor home and are off in it for the first time later this week to a main Caravan Club site, so that if we get stuck with anything we can cry help!! Our main want was swivel seats as we both have bad backs and found caravan seats uncomfortable for longer periods. Have noted the comments about packing things and will no doubt be re-arranging stuff for weeks to come!!!! Having read all the comments it was not pointed out that if you tow a small car behind a Motorhome you have the economy of a small car when you have reached your site plus the luxury or reclining swivel seats something a caravan does not have. We started out with a caravan years ago and then switched to a VW Trident camper van. Sold this and then purchased a 4 berth camper van. Sold that and have now purchased a 4 berth swift caravan. Prefer the caravan because it is a home on wheels. Once set up the towing vehicle becomes the convenient transport to view an area. The modern caravan design means that you are no longer dependant on site facilities. Ours has a super end bathroom and a bed in which we sleep more comfortably than our bed at home. It tows beautifully behind our Mondeo and proves to be quite economical to pull. Despite having modern facilities the last camper van was cramped inside in comparison to the caravan and restrictive when travelling along narrow roads in places like Wales, Lake District and the West Country. Many car parks have height restriction barriers. The camper van can give you a false sense of security. We have just had some friends return from a trip to Wales where late one evening they were parked on the seafront and a large group of youths ( if that is the correct expression) exited the nearby pub and as a means of providing themselves with a bit of fun grabbed hold of the skirt on one side of the van and proceeded to rock it violently. This caused them extreme stress and damaged that side of the van. The following day they were travelling down a narrow beach road and a white van man was travelling in the opposite direction at speed and the white van’s mirror hit the corner of the camper van, denting it. As a consequence our friend has had to spend £1,800 having it repaired. This whole episode ruined their trip to Wales and it is unlikely that they will ever return. I wonder if those same youths are wondering why no jobs are being created in the welsh tourist businesses!! How much safer to park your caravan on a secure site. Those youths would not have thought about doing this to a car! The economics of a caravan are better than a camper van. No VEL, insurance is cheaper (unless you use the camper van for your daily use at home), and maintenance costs are higher in all respects. Yes we are considering changing from a caravan to a motorhome when my husband retires. I am the one that drives and no longer want to tow a caravan. My wife and I are sitting here having this very debate at present and our Fiat Ducato van may soon be traded for a fixed bed caravan. This appears to be the wife’s main motivator for change, as for longer holidays converting the bed morning and night is a pain. Also we would like to be able to leave the site and explore local villages etc. this is definitely easier for caravan owners but having said that I do feel it is safer in the motorhome on longer journeys. Then my husband became ill and I am a full-times carer needing somewhere to escape – so I bought something I had always fancied – a small motorhome (Nu-Venture Surf with a loo- essential) now on days when I have a carer in I have a comfortable space to go – which is MINE – I can drive it off on good days and park up on the Common, have a cup of tea, listen to CD’s – even take a friend (when someone has dementia your friends are not always so keen to visit you at home) I also did a deal with my son – he can borrow it and in return he comes and looks after his Dad while I go off – just me and the dog. Usually Adults Only Parks – I can sleep the clock round and re-charge my batteries – great. I keep it charged up by driving it to Tesco’s (10miles away) – If you have far-flung friends you can meet half-way – use your m’home to sleep in and use their car to tour round – brilliant. I have taken on board the previous comments of ‘both sides’. I was a motorhomer for 17 years, and my last one (of five) was an awe inspiring Carthago, something I’d dreamt of and eventually achieved in owning, at a considerable cost (boys and toys!). I agree with all the various points of view, but my main differences, now that I have transferred ‘over to’ (but not ‘down to’) a Bessacarr Cameo 625 caravan, being towed by my BMWx5, is not necessarily the differences of being on site as much as getting to the site. From the cockpit of the motorhome one had a much better vista of the surroundings, and by and large the journey felt ‘safer’. With 2 dogs, howerver, the fixed dining table in the Carthago was a distinct dissadvantage regarding freedom of movement and many site owners were none to friendly to the vans size and weight when parking. Overall, and taking into account the freedom of a car at the base, we are greatly enjoying our caravan and do not miss the motorhome with it’s luxury, and it is much easier now to explore the local towns and countryside, whereas before we would be only be able to pass through….and my bank balance is now much more favourable. Been there, done that! We have moved between campervans and caravans over the years, both have their own advantages and disadvantages. We like the size of a caravan on site but hate towing it. Also, when you are working, a weekend away can be difficult to do on the hop. We found that by the time we get home, load up the car, down to the storage yard and hitch up, we were lucky to get on site before 9pm and lots of sites close the office early, then so you are left on the late night arrivals area. With a campervan (we have a Autosleeper Duetto high top) you can get up on a Saturday morning, jump in the van and off you go, book in to your chosen site, visit the local attractions and come back to the site later in the day. Sunday morning instead of packing up as with a caravan and going straight home, you can go off in your campervan for the day, stop off en route and enjoy a full day out. We also use ours for day trips, we have our own facities whatever the weather. There are merits both ways, but we use ours all the time. It is a second car that we can park outside our house unlike a caravan, we have stayed in friends gardens overnight after a party and used it a additional bedroom for ourselves when we have had a house full. Biggest disadvantage is cost of buying, but take a decent sized car and a caravan and you are near the price of a secondhand campervan. used to drive furniture vans and in windy weather it was like sailing a yacht so I like a stable ride,which I get in my 20 ftAutosleeper motorhome.I agree that both sides in this ongoing saga have good points to fight their corner with but at the end it comes down to what your comfortable using.My van is small enough to go where ever a car goes and parks well as long as I am considerate of others.One thing we can all agree on is that we all have a great time getting out and about and meeting each other. have fun. Interesting, got a caravan as couldn’t afford a motorhome anyway. You can get a decent new car and decent new caravan and still have a few grand to spare for the price of a decent SECOND hand motorhome – thats a crucial point! Reversing is another plus for the motorhome though, most stressfull part of caravanning for me. That said I could get a motormover installed and still be quids in with the motorhome comparison. out of towns and in inaccessable places so the need for a car or some form of transport of our own was the only answer so we changed back to a caravan. Caravan for me every time thanks. Don’t see the point of driving the caravan and towing a tiny car. Much rather have my Range Rover with me when I get there. One less thing to tax and MOT as well. Not that some motorhomes aren’t exceedingly luxurious though. The posh ones are tempting sometimes but ultimately I always come down to the same decision.